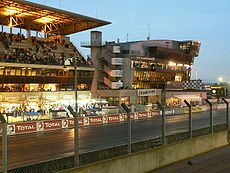 The 24 Hours of Le Mans (French: 24 Heures du Mans) is the world’s oldest active sports car race in endurance racing, held annually since 1923 near the town of Le Mans, France, and is considered to be one of the most prestigious automobile races in the world. Commonly referred to as “the Grand Prix of Endurance and Efficiency,” racing teams have to balance speed with the cars’ ability to run for 24 hours without sustaining mechanical damage, and manage the cars’ consumables, primarily fuel, tires, and braking materials. The endurance of the drivers is likewise tested, as drivers frequently stay behind the wheel for over two hours before handing duties over to a relief driver during a pit stop. Drivers then grab what food and rest they can before returning to drive another stint. Current race regulations mandate that three drivers share each competing vehicle.